Alexander Alyabyev (born August 15 [August 4, O.S. ], 1787, Tobolsk – died March 6 [February 22, O.S. ], 1851, Moscow) was a Russian composer, pianist, conductor. Alexander Alyabyev was born in 1787 in Tobolsk in Siberia. As most of noble children, he did not attend school, and was educated at home and then he studied at Moscow University. During the Napoleonic War in 1812 he joined the Russian Army and reached Paris with it. Alyabyev participated in the battles, he was wounded and won two awards. When he returned after the war in Petersburg, he became friendly with the leading representatives of the Russian intelligentsia. Among his friends were Griboyedov and Odoyevskiy and future Decembrists Mukhanov and Bestuzhev-Marlinskiy. Decembrists’ ideas have shaped the views of the composer. In St. Petersburg Alyabyev began to seriously pursue music composition. Soon he acquired fame writing music for theater, he also wrote operas and romances. Alyabyev composed quartets and trios. In the middle of twenties, he composed his most well-known work The Nightingale (Solovey), a song based on a poem by A. Delvig. The Nightingale still sounds on the concert stage, it’s instantly recognizable and liked by the audience. Alyabyev’s life was full of vicissitudes. In 1825, he was falsely accused of murder during a card game and arrested. He was kept in prison for three years. 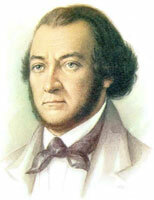 After long judicial process Alyabyev was sentenced to exile to Siberia, he was deprived of all rights and his noble status. Apparently, the government tried to get rid of the person who was in a good relationship with the Decembrists. Severe trials didn’t break Alyabyev. In Siberia, he worked hard, he formed a military brass band, participated in concerts, composed songs and romances (including autobiographical romance Irtysh), as well as symphonic and chamber works. A few years later Alyabyev received permission to go to the Caucasus to improve his health. The composer was greatly impressed by the Caucasus Nature. Alyabyev listened and occasionally wrote down the songs of the Caucasian peoples, and later created a series of works on Caucasian themes – The Georgian song (Gruzinskaya pesnya), The Kabardian song (Kabardinskaya pesnya), opera Ammalat-bek, melodrama A Prisoner in the Caucasus (Kavkazskiy plennik) based on the story of Pushkin’s poem. Then Alyabyev worked on the collection of Ukrainian folk songs. Later Alyabyev had to settle down in Orenburg, there he continued studying and collecting folk songs, during that period he collected Bashkir songs. Alyabyev spent his final years in Moscow, he lived there illegally. Having got acquainted with the works of the revolutionary poet Ogarev, Alyabyev wrote some great songs based on Ogarev’s poems. Kabak, Izba, The Village Watchman (Derevenskiy storozh) reflected a heavy life of the Russian people. Alyabyev died in 1851 in Moscow. The Nightingale (Solovey) is one of his most famous and most popular songs. The song is humble and simple. It is preceded by a lively piano join in the spirit of folk tune guitar. Captivatingly soft, wistful melody develops from the first vocal intonations. The broad and smoothly rounded, the song immediately captures and captivates with its austere beauty. In Russian folk songs the average deviation from minor to the parallel major (D minor – F major) gives the sound a lighter shade. The lively chorus sounds contrasting, it is based on the music of instrument introduction. THE SECRET SORROW (Your image is as hazy as the distance)- TAYNAYA SKORB’ (Tumanen obraz tvoy, kak dal’). Dedicated to Isleneva Natalia Alexandrovna. I SEE THE IMAGE OF YOU (YA VIZHU OBRAZ TVOY). Dedicated to Afrosimova Ekaterina Alexandrovna. THE RING (I look sadly at the cherished ring)- KOL’TSO (Pechal’no na kol’tso zavetnoye glyazhu). Dedicated to Afrosimova Ekaterina Alexandrovna. THE SECRET (I won’t say, i won’t confess)- TAYNA (Ya ne skazhu, ne priznayus’). Dedicated to Afrosimova Ekaterina Alexandrovna. WHERE ARE YOU, MY DEAR FRIEND (GDE TY, DRUG MOY MILYI). Dedicated to Afrosimova Ekaterina Alexandrovna. SORRY! HOW SAD THIS WORD IS … (PROSTI! KAK GRUSTNO ETO SLOVO…). Dedicated to Afrosimova Ekaterina Alexandrovna. SIZHU NA BEREGE POTOKA. Dedicated to Alexey Nikolayevich Verstovsky. CIRCASSIAN SONG (CHERKESSKAYA PESNYA). Dedicated to V. Zavadsky. From The Prisoner of the Caucasus (poem). HAPPINESS IN A DREAM (SCHAST’YE VO SNE). Dedicated to Isleneva Sofya Vladimirovna.